A great promotional product for all groups. Sleek compact design contains 5 Brand adhesive bandages. Economical and refillable. Refillable plastic dispenser holds bandages within easy reach. Conveniently tuck into a purse, glove compartment, golf bag or backpack. Includes five bandages. Your price includes a one-color imprint on the front of the bandage holder. Personalized Adhesive Bandage Dispensers give busy moms and dads a first aid solution that's always within reach! These handy bandage dispensers are perfect for handling scrapes, scratches, and minor cuts and burns. Each adhesive bandage pack contains 5 bandages. Parents, teachers, and caregivers will love keeping them on hand to treat all of life's little ouchies. These convenient custom bandage dispensers are ideal for handing out at trade shows, conventions, and expos. Add your company's logo or slogan to show your customers and your community that you care! 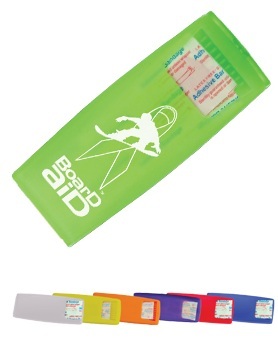 Adhesive Bandage Dispensers make great promotional giveaways at wholesale prices. Can be customized with your logo. Give us a call (706-374-0710) for a FREE quote and to put our years of promotional and advertising experience to work for you.